Each Tuesday in November at 6pm PST, join me and a dozen or so other wine writers on Twitter for #WineStudio where we will be exploring the “renaissance of Chardonnay” in Oregon’s Willamette Valley located just south and west of Portland. Not everyone knows that there is more to Oregon wine than the Willamette’s famed and lovely Pinot Noir. And not everyone appreciates the minerally, acidic, textural, and florally complex Chardonnay common to this region. In fact, when I stopped to buy some eggs and pick stone fruit at a farm in the Willamette in 2011, a woman asked me specifically what I thought about them. When I raved, she admitted that she much preferred the buttery oak style often associated with California Chardonnay. Personally, I prefer sucking on a stone than on a stick! During Tuesdays in November, we will be guided as we taste two or three wines and learn more about terroir, sustainability, biodynamics, philosophy and evolution of the region by tasting these select Oregon Chardonnay wines and wineries. I’m excited to build on what I’ve learned during other tasting adventures in this region in 2011 and again in 2012 when the Wine Bloggers Conference was held in Portland. Follow us on Twitter –our handles are listed below; just click on it and follow. Follow the conversation on Twitter by searching for #winestudio or clicking on the highlighted hashtag below. Find the bottles we’ll be tasting by ordering them from the wineries using the links to the wineries below or find it near you using the 1000 Corks search engine. Then open your own bottle of Oregon Chardonnay and compare your notes with ours! On our first outing, on November 4, we head for the mountains –specifically Cooper Mountain– where birders like me find eyries for raptors like the one on the label for Eyrie Vineyards. 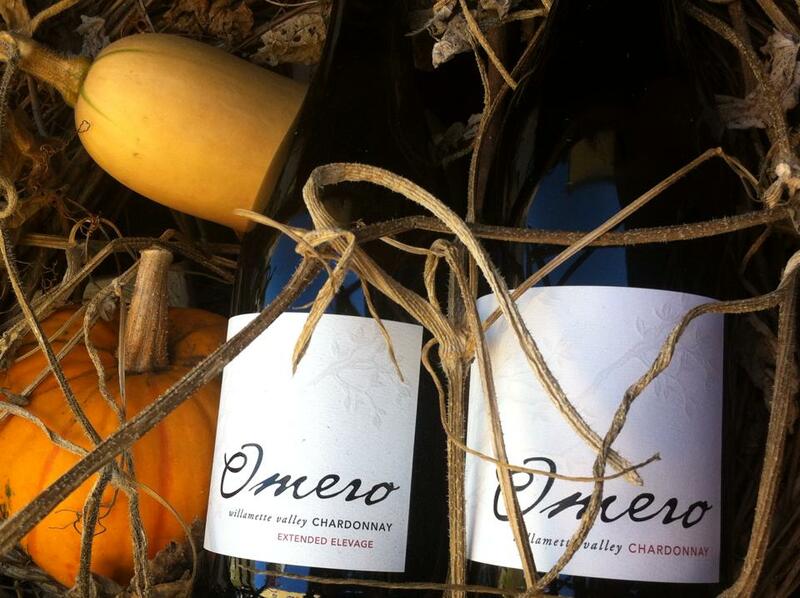 The Omero wines were sent by accident to Elaine! But new bottles are on the way and should be here in plenty of time for the tasting Nov. 18. UPDATE: They arrived so here’s their portrait! For our final tasting, we have one bottle left of the eight in the series–and I am sure we are going out with a bang! What do YOU like to pair with Chardonnay? What’s YOUR favorite style or region of Chardonnay? And, while we’re talking white wines, have you tasted Oregon’s pinot gris?